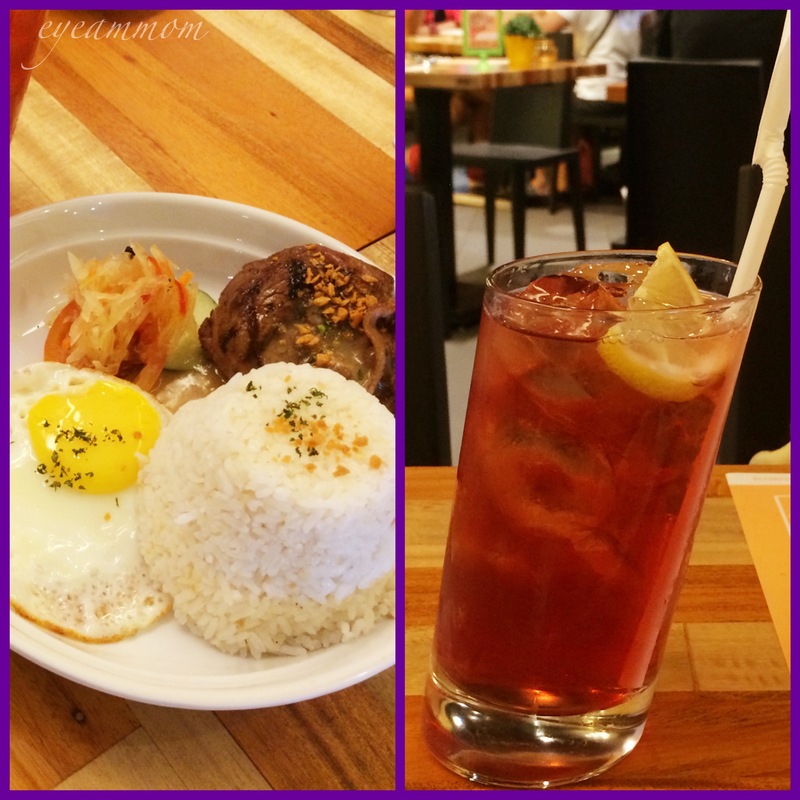 We were in the Trinoma Mall over the weekend and we wanted to try a new restaurant. 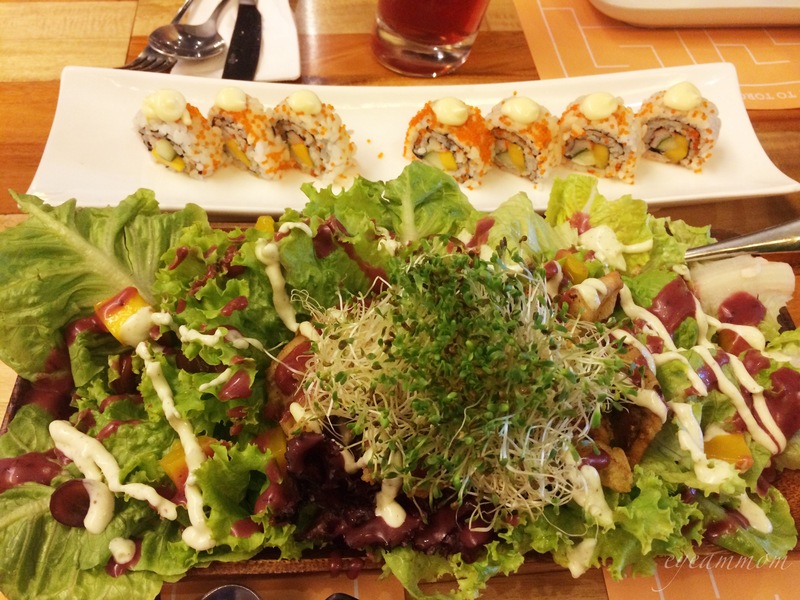 Torch Restaurant says their specialties are sushi, pizza and steak – and since we love all those, we decided to give it a try. While waiting for our order, we were given this serving of fried crunchy noodles. It was a pleasant change from the usual. The California Roll was okay, just like the ones you would have in any Japanese restaurant. The Softshell Crab Salad, though, was a delight! I didn’t think the softshell crab would work with the greens and fruits, but it did! I just wish they put more dressing than they did. The steak and eggs was generally okay too. The steak was tasty enough, but a little dry and on the tough side. We ordered it medium rare but was served rare, so you might want to adjust your order accordingly. It came with a glass of refreshing red iced tea. I love how their glass looks like it’s leaning to one side. Of all the dishes we ordered that day, the Burger Mac and Cheese was the best! 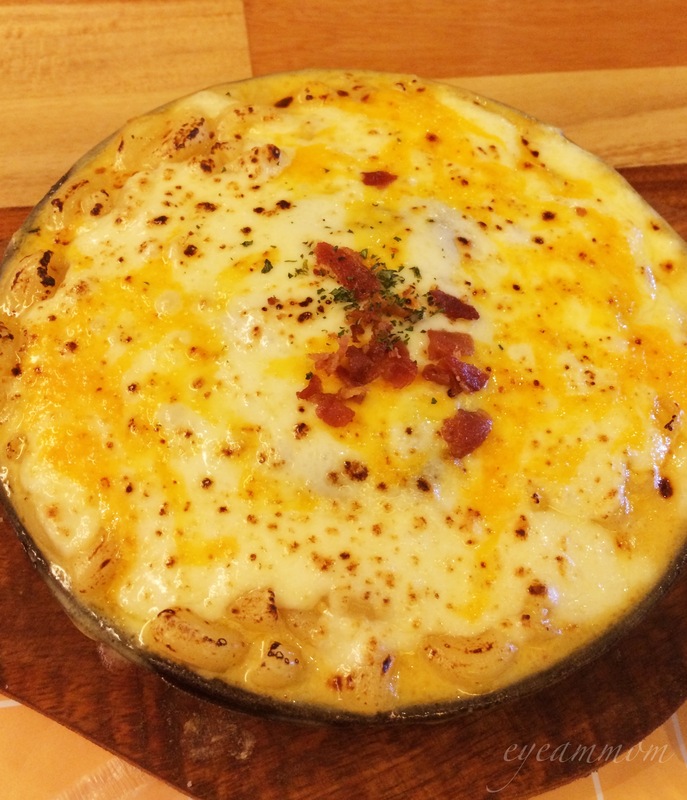 It was served in a skillet, the cheese topping nicely-browned and bubbling, with a sprinkling of bacon. We’ve ordered mac and cheese in different establishments and we think that this is one of the best versions around. We wanted to try their desserts too but we were just so full already. We will definitely come back to try other items on their menu. This entry was posted in Food, Life in the Metro and tagged macaroni and cheese, steak, Torch Restaurant. Bookmark the permalink.